There was no effect of food on the absorption of acyclovir (n=6); therefore, acyclovir oral suspension may be administered with or without food. Acyclovir oral suspension is intended for oral ingestion only. Renal failure, in some cases resulting in death, has been observed with acyclovir therapy (see ADVERSE REACTIONS: Observed During Clinical Practice and OVERDOSAGE:). Thrombotic thrombocytopenic purpura/hemolytic uremic syndrome (TTP/HUS), which has resulted in death, has occurred in immunocompromised patients receiving acyclovir therapy. Of 376 subjects who received acyclovir in a clinical study of herpes zoster treatment in immunocompetent subjects â‰¥ 50 years of age, 244 were 65 and over while 111 were 75 and over. No overall differences in effectiveness for time to cessation of new lesion formation or time to healing were reported between geriatric subjects and younger adult subjects. The duration of pain after healing was longer in patients 65 and over. Nausea, vomiting, and dizziness were reported more frequently in elderly subjects. Elderly patients are more likely to have reduced renal function and require dose reduction. Elderly patients are also more likely to have renal or CNS adverse events. With respect to CNS adverse events observed during clinical practice, somnolence, hallucinations, confusion, and coma were reported more frequently in elderly patients (see CLINICAL PHARMACOLOGY, ADVERSE REACTIONS: Observed During Clinical Practice, and DOSAGE AND ADMINISTRATION). 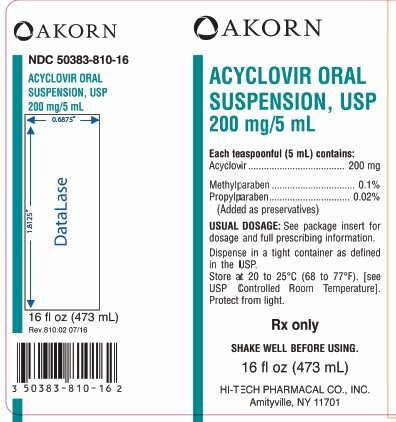 Acyclovir oral suspension, USP (off-white, artificial banana-flavored) containing 200 mg acyclovir in each teaspoonful (5 mL) â€“ Bottle of 1 pint (473 mL), 5 mL unit dose, 10 mL unit dose and 20 mL unit dose. USUAL DOSAGE: See package insert for dosage and full prescribing information. Dispense in a tight container as defined in the USP. Store at 20 to 25°C (68 to 77°F). [see USP Controlled Room Temperature]. Protect from light.